Logan Schiciano is currently one of the sports page designers for Tower.While this is his first year on staff, Schiciano has experimented in writing a wide variety pieces, including his two pieces on students who do the arts/play sports outside of school and his news story on the Jonestown trip that was broadened to a Southern expedition. 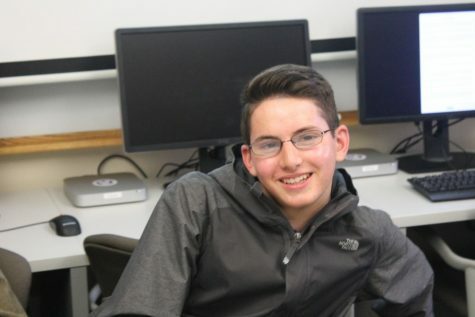 He has taken his passion for sports to the field of broadcasting, as this year he worked alongside fellow Tower staff member, Mitch Fink, to provide commentary and analysis for a myriad of Boys and Girls Varsity basketball games. Schiciano enjoys writing for Tower mainly because he enjoys reporting and providing the community with compelling issues and features. His favorite part is getting to see the final product arrive from the press, as he feels it is a demonstration of all the hard work he and his fellow staff members have dedicated to the issue. Schiciano is an athlete himself and participates on the Masters Cross Country, Indoor Track and Golf teams. In addition, he is also one of his grade’s MISH representatives and holds leadership positions in EFFECT and Gold Key. Outside of school, he is a dedicated skier and has been a ski instructor for young children in Stratton, Vermont the past two years.